Squash House Quilts: Dear Lenni... and a Great Tip! Oh how exciting Candace!! I wish I could come and watch the delivery, set up and lessons - it's going to be so fun for you! And thanks for the great tip! I'm off to clean my rulers. Hey Lenni - Buh-bye! You are definitely history!!!! Oh a new Gammill - YUMMY!! I'm so excited for you, Candace. I know you're going to have lots and lots of fun. It never occurred to me to clean the underside of my rulers. I can imagine the cruddy build up - ick! Thanks so much for the tip. Yipee!! I'm so happy for you and excited!!! Honestly, yes I almost shed a tear. Lenni was a complete tease!! :-) I just can't wait until Friday for you. I'll be expecting a full report after this weekend. Good for you!! Enough time had passed. Everyone I know that has a Gammil loves them. And thank you for that ruler tip. I'm headed for the windex. I wish I could be there too! How exciting. I'm glad you're finally getting your long arm. I'm looking forward to plenty of blog posts regarding your experiences. What a great tip about the rulers. I would never have thought of it. You will love your Gammill. Even more you will love quilting on a longarm. At first it will be scarey. Just remember to breath. Ohhhh I am so excited for you...what fun you will have...can't wait to hear. Too bad that Lenni, had such a hard time getting his act together. I think you made the right move, sounds like Gammill will be there for you and that is what you need. I have never cleaned my rulers. Guess I have work to do. I think Lenni will regret his decision to play hard to get. Meanwhile I wish you a long and meaningful relationship with Gammill. Thanks for the tip on the rulers. I'm so sorry Lenni has let you down, but I'm sure you will be happy with your Gammill. I know that I love mine. lol how cute, I have 2 machines that let me down all the time & when I look at new ones I know they feel betrayed LOL great tip! When a guy gives you the "brush-off", move on! Smart Girl! It's never too soon to start dating again! What a heartbreaking story! I think Lenni got what he deserved, and I hope Gammill will prove to be ther right choice. - I'm off to clean my rulers now. Great post! I bet things will work out for the better this way...can't wait for Friday now! Love your Dear Lenni letter. Can't wait too see you quilting away! Never heard that about the rulers. I have Omnigrip on mine but maybe I need to"re-grip" them because they too slide once in awhile. Great tip...thanks! How exciting for you! My daughter is dating a boy with the last name Gammill and the first thing I thought of was, "I wonder if I can get a deal on a machine from him?" LOL! Of course I knew he wasn't related but it made me smile. I'm excited to see your post on it and I hope Mr. Squash gets lots of fun pictures of you. Good decision, I believe they are all good machines, just like cars. I love my Nolting, they've been fantastic to me, and I've played on an A-1 and I love that one too. Have a blast with your new best friend! Thanks for the cleaning tip! Thanks for the ruler clean-up tip. Something I never thought of! Have fun with your new companion! You are brave to end it all with such an unresponsive fling and move on. Glad to hear your next crush is on the way already! Looking forward to seeing your new man. Thanks for the tip about the rulers. Gammill has been patiently waiting on you to see the light! How exciting - I bet you have a wonderful time with Gammill. Things happen for a reason. I'm guessing that you and your Gammi were meant to be. Looking forward to Happy Friday. 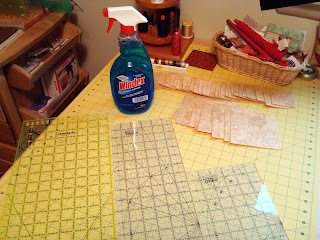 Thanks for the tip on ruler cleaning - it's been a long while since I thought to do that! Sorry things didn't work out with Lenni, but he had his chance! LOL There's more than one fish in the sea. I'm sure you'll enjoy your Gammill. How exciting! Now that I have wiped away my tears (of laughter) over your ending the affair with Lenni, I am so excited for you for Friday. I am looking forward to hearing all your adventures in Gammill land. Thanks for the ruler tip, I have never thought of doing that, and some of my rulers are 10 years or so old now. Down with Lenni! Up with Vinnie! And your idea for cleaning you rulers... oh my gosh! You're brilliant! A genius! I never, ever, EVER would have thought of that and since I use starch and/or sizing, I am sure I have the same gunky crud on my rulers. Thank you for the terrific tip! Wow, that's some fast service from Gammill! You've obviously made the right choice and will be stitching away in less than 48 hours!!! Woo hoo! I hope Lenni and his friends have a good marketing firm on speed dial! I thought I was reading wrong in the first post that you were getting a Gammill but now I see it is right. Well, that is too bad that Lenni would not hold up to his side of the bargain. Yay! for Gammill for being quick on the draw. Wow! I do prewash but I bet my rulers still get dirty! I think a cleaning is in order. Wow, I don't think I have ever cleaned my rulers, or even thought about it! My Husband came back with what seems like 40 gallons of Windex from Costco, so I better get to it!